Heather Craft is a perfect example of an entrepreneur who has turned her passion into a business. With the opening of her Shiloh bridal boutique, Bridal Parlour, this week, she is eager to help brides find the perfect dress for their special day. 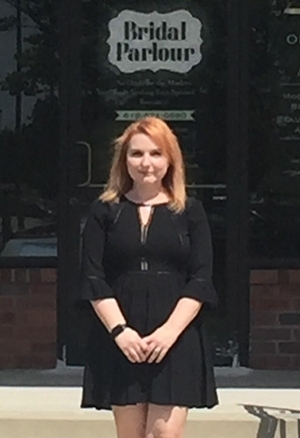 The Illinois Small Business Development Center (SBDC) for the Metro East at Southern Illinois University Edwardsville has assisted Craft in making her dream a reality. Bridal Parlour’s grand opening will take place Tuesday, Aug. 1 from 6-9 p.m. for friends and vendors. A special grand opening is set for Saturday, Aug. 5 from 4-6 p.m. for brides-to-be. The boutique is a much-needed addition to the city’s growing commercial district. Craft has been in the bridal industry for eight years, and has been visualizing the Bridal Parlour idea for some time. “Owning a business runs in the family, so it was bound to happen,” she said. The SBDC, at the direction of Interim Director and Small Business Specialist Jo Ann Di Maggio May, met with Craft to walk her through potential obstacles. The extensive one-on-one business services included the development and review of her business plan, preparing financial documents, expertise on marketing, and other references to anything else she needed. Di Maggio May also suggested networking with Shiloh’s Chambers of Commerce and other local groups, and aided in determining the appropriate location for Craft’s store. Bridal Parlour offers dress styles ranging from modern, bohemian, romantic, edgy and everything in between. This is the destination for free-spirited brides seeking unique dresses and exclusive designer styles. Craft’s goal is for every bride to have an intimate experience with an expert stylist, while being surrounded by their loved ones. Having a special bond with customers is one of the reasons she enjoys the industry. “It is such a blessing to be allowed to part of someone’s wedding day,” Craft said. “This is the gown in which you marry your best friend and love of your life. Whether it is an intimate gathering or a huge event, the wedding gown helps bring the bride’s vision to life. It is the only time everyone you care about will be in the same place with you. It is a celebration of love, family and friends. Bridal Parlour is involved in multiple trunk shows in the upcoming weeks: Pheia Bridal on Aug. 4-6, Anais Anette on Aug.18-20 and Loulette Bridal on Aug. 24-Sept. 3. Craft is extremely proud of her boutique and the values of her business. She also realizes she would not be able to do it without the help and support of the SBDC, her staff and loved ones. Craft is ecstatic that she got all the designers she wanted and found a great location for her boutique. The Bridal Parlour is located at 3630 Green Mount Crossing Drive, in Shiloh. Hours following the grand opening will be 11 a.m.-7 p.m. Tuesday-Thursday, 11 a.m.-5 p.m. Friday and 10 a.m.-5 p.m. Saturday. For more information, visit bridalparlour.net. The Illinois Metro East SBDC assists start-up ventures like Bridal Parlour as well as existing businesses headquartered in the nine-county region of Calhoun, Jersey, Madison, Bond, Clinton, St. Clair, Washington, Monroe and Randolph. It is funded in part through a cooperative agreement with the U.S. Small Business Administration, Illinois Department of Commerce and Economic Opportunity, and SIUE as a service to Illinois small businesses. By aiding entrepreneurs and companies in defining their path to success, the SBDC network positively impacts the Metro East by strengthening the business community, creating and retaining new jobs and encouraging new investment. It enhances the region’s economic interests by providing one-stop assistance to individuals by means of counseling, training, research and advocacy for new ventures and existing small businesses. When appropriate, the SBDC strives to affiliate its ties to the region to support the goals and objectives of both the SIUE School of Business and the University at large. To learn how the SBDC can help your small business, contact the Metro East SBDC at (618) 650-2929. Photo: Heather Craft, owner, Bridal Parlour in Shiloh.